The standard method of transferring an asset from one party to another is to use an intermediary to perform the transaction. The most common method to transfer large value assets over time is for the intermediary to provide credit as a money loan. Loan Coupons is an alternative to transfer and asset from one party to another where the borrower provides the credit directly. The difference between regular loans and Loan Coupons is that regular loans create money to facilitate the transaction. When we create regular money there is a charge put on the money tokens. With Loan Coupons the Coupon is a form of money and has no charge on the money tokens. Charges on money tokens take the form of interest on interest. With Loan Coupons there is no interest on interest. This reduces the cost to transfer an asset. With regular money the value of money depreciates over time due to inflation. With Coupons the number of Coupons outstanding increases with inflation. This means inflation does not disadvantage the provider of credit. Coupon rules can be adjusted for particular asset transfers. This is illustrated later in this paper with a description of Water Coupons issued by a Water Authority to build new assets to deliver water supply to a community. In the example the Water Coupons can be used to provide a discount to low consumers of water. The Water Coupons are used to create more water supply. This then leads to a price mechanism for water in a price regulated environment. The calculation of the cost of transferring assets over time is complicated as there are many factors influencing the calculations. Many economists deny that reducing the cost to transfer assets matters because if the borrower pays more then the lender receives more and hence what one party gains the other loses. This means any change to the method is a zero sum game and the overall effect on the economy is cancelled out. This is incorrect. If the total amount transferred is less with one method than with another method then the cost savings can be given to either the lender or borrower or to both. These cost savings are real and reduce the cost to transfer or build assets. Inflation makes a difference to the cost because the value of the money transferred is reduced the later it is transferred. This is a cost to the provider of credit. The length of time, the interest rate, taxation, and transfer fees all change the calculations. All these costs except the cost of interest on interest and inflation are linear. Coupons eliminate the cost of interest on interest and compensate for inflation. This means the difference between Loan Coupons and Bank Loans can be estimated by calculating the difference in cost with zero inflation. This is a non linear function but for a 30 year loan at 5% the extra cost is estimated at up to 70% of the original amount when tax and transfer fees are included. 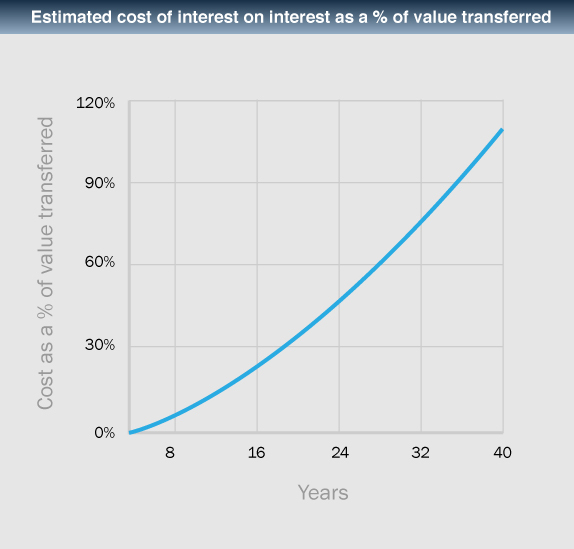 The following graph estimates the increase in costs caused by interest on interest. These extra costs are masked to the borrower because inflation reduces the value of money and so moves the costs of the transfer from the borrower to the lender. Inflation however, is a real cost and compensating for it does remove it. To get the full cost reduction of removing interest on interest inflation needs to be zero. Loan Coupons simplify the calculation of returns and better reflect the reality of investment. Most assets do not get more valuable over time simply because of the passing of time. Compounding of interest means that the asset class of money gets more valuable over time. The system effect caused by the widespread use of compounding interest is for the asset class of money to get less valuable through endemic inflation. Water Coupons and Rewards can take many forms. For illustration purposes the following rules are used for Coupons to transfer water infrastructure assets. Water Coupons are created by a Water Authority to fund new water infrastructure or to pay out existing loans. Water Coupons are redeemed by using them to pay invoices for water consumed. Water Coupons are measured in litres of water. The Water Authority is under no obligation to redeem Coupons for money – only for water. Water Coupons increase in amount for every day they are unused. For simplicity and comparison purposes the amount of the Coupons to be repaid could be increased by the anticipated inflation rate over the time the Coupons are to be redeemed. Water Rewards is a voluntary system where registered consumers are given Water Coupons depending on how little water they consume. They typically sell the Coupons to investors or to high consumers of water. They provide an incentive for consumers to reduce their consumption of water. They can be sold to high consumers of water. As there is a limited supply of water this provides a pricing tool for a Water Authority to reduce water consumption in times of limited supply. From the point of view of lenders and the Water Authority, Coupons appear like loans – with different rules of repayment. One difference is that Coupons are sold directly to investors with existing funds including banks. 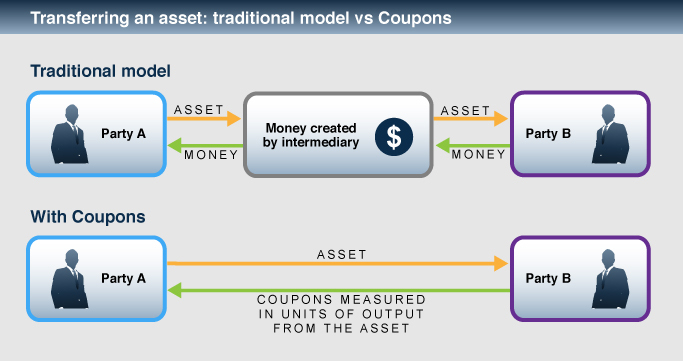 Another difference could be the linking of Coupon value to the value of the Asset Output. In the attached spreadsheet (obtainable from the author on request) a comparison is made between an investor depositing money in a bank account and purchasing Coupons. The investor receives a return of 4.5% and the Authority is charged 6% by the bank. This provides the investor with an IRR of 3.67% after taxes. With Coupons an investor can obtain an IRR of 3.7% if the Coupon rate is 3.5% and is adjusted yearly for inflation of 3% per year. The length of the loan is 30 years and the repayments or redemptions are carried out yearly. Using this scenario the Water Authority could borrow 18% more money for the same rate of repayments. The investor gets approximately the same IRR on funds after tax and fees are removed. Alternatively, the Authority could give a 5% flat return adjusted for price increases. That is, if the Authority was able to increase the price of water then the return would be adjusted by the same amount minus the cost of tax and transfer fees. If the price of water increased by 5% then the Coupon amount owed would increase by 4.5%. This approach gives the investor an inflation adjusted investment of 5%. Using this approach the Authority could borrow about 25% more funds for the same price adjusted rate of redemptions. This would also lower the risk to the Authority as the return to investors would be tied to the Authority income. There are three markets in Coupons. The first is where the Authority issues Coupons. It is expected that the terms of Coupons will vary to take into account market rates for funds. The second market is where Coupon holders can sell their Coupons to other investors. The third market is where Coupons are sold to consumers to pay their water invoices. The system operator will run all markets for the Water Authority. The Role of the Operator of a Coupons System. The operator of a Coupons system provides marketplaces for Coupons. The operator takes no financial risk and is only an intermediary between a buyer and seller of Coupons. Transaction fees when Coupons are exchanged are used to pay for the market where the size of the fee is related to the size of the transaction and has been initially estimated at 5% of the redemption transactions. When an Authority creates a Coupon it appears on the balance sheet as a long term liability expressed in kilolitres of water. Each year the Coupon is not used the liability increases by some amount and the long term liability of the Authority increases. This increase in liability could show on the P&L as accrued interest or it could be a revaluation of asset which would show on the P&L at the time the Coupon interest is redeemed. The treatment will depend on the Tax Office. For investors Coupon interest is not realised until the Coupon is redeemed. This again could be considered either as income at the time it is accrued or as income at the time it is redeemed. This will depend on the Tax Office interpretation. Investors in Water Coupons will hold an investment that is likely to preserve its value because the price of water is likely to increase with inflation and increasing demand. The Coupon conditions can be set so that the value of the Coupons is guaranteed to rise with inflation. The market in Coupons and the use of Coupons to pay for water consumption means the Coupon Market will be liquid but have price stability with a known return. Using the same system and providing a mechanism for the transfer of Coupons between systems increases the depth of the market and increases market stability. Individuals volunteer to receive Water Rewards. Rewards are not a right but are a Reward for low per head consumption. This means if any individual cheats the system they can be banned from receiving Rewards. Individuals attach themselves to a water meter and the amount of water per head passing through the meter is used to calculate the Rewards. The Water Authority sets the amount of the Reward and the rules associated with operating the system. Water Rewards helps an Authority overcome the conflict implied in the need to charge more for water the less that is consumed. It does not make sense to consumers to pay more for water in times of high rainfall because they are using less water. It makes sense to consumers to pay more for water in times of drought but charging everyone more for a common resource is seen as inequitable. Issuing Water Coupons, equivalent to the amount used for depreciation and maintenance of the water infrastructure, and giving the Coupons to those who consume less water is a way of restricting demand in a fair manner. It means the price of water can be increased in times of drought – if the increase is returned to the community through Water Coupons. Such a system should pass the scrutiny of Pricing Regulators. Viewed as a self contained system Water Coupons and Rewards provide a means of fairly allocating a common resource of water. Funds supplied by Coupons are only used for increasing and maintenance of supply, and are not diverted to other uses. Rewards entitle those who do not use the common resource to receive some compensation from those who do. The system provides incentives for the Authorities to use funds wisely and for consumers to conserve the common resource. The cost of developing and running a Water Coupons System will be paid by the organisation operating Water Coupons. This could be the Water Authority or another party. The system will be developed in stages but should be fully operational within six months of a decision being made to deploy. Appoint an organisation to build the Coupon system. Water Coupons and Rewards provide a mechanism for Water Authorities to fund Water Infrastructure in a less costly manner than existing money loans. The risk of default of an Authority is reduced and the Authority will make higher profits. Water Rewards helps reduce the conflict in the supply and costing of water. The system requires no significant change or cost to the existing operation of the Water Authority systems and can be introduced incrementally with no disruption to the supply or payment of water. Coupons can be used in any situation where credit is extended to a buyer. By removing interest on interest and by adjusting credit for inflation means that the tokens used for credit have no value in and of themselves. This removes the “time value of money” but does not remove the time value of credit. Because there is no longer a charge on money tokens investors and borrowers can take a long term view of investments and there will no longer be the imperative for an organisation to repay credit at the first opportunity. This environment favours patient capital. Because the uncertainties of interest rates and inflation are removed from investment decisions it becomes easier to calculate returns on investments which in turn will lead to better investments. Because money tokens need no longer have a value any government can issue money tokens with zero interest to build new assets that will increase the wealth of citizens. All new public infrastructure could be financed with zero interest Coupons. This reduces the need for governments to tax citizens to build public infrastructure. However, the government may choose to issue interest bearing Coupons for infrastructure purposes and use the returns from the investments to reduce the need for general taxation. The widespread use of Coupons is likely to lead to a reduction or even elimination of monetary inflation. The reason is that few people will take out regular loans preferring to use lower cost Coupons. Eliminating or reducing inflation reduces the cost of transferring assets. Inflation occurs if there is too much money chasing too few goods. If too much money is created then it will have to be spent creating new goods of new value using Coupons because value is created by building assets – not by leaving money in accounts collecting interest.